This is F1Minute - Hamilton and Maldonado make front row for Singapore GP. Qualifying began with the unusual sight of Kamui Kobayashi struggling for pace. The Sauber driver lingered in the drop zone of the first session, improved his lap time to move out of it, but was pushed back in again to become an early qualifying casualty. 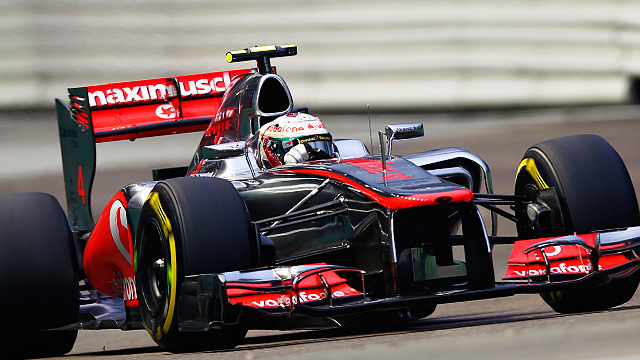 Neither Sauber car looked like it had pace, with Sergio Pérez only managing 14th to Kobayashi’s 18th. In the second session, Bruno Senna crashed into the wall, causing just enough damage to the car to stop him setting a time. Nico Hülkenberg finished just outside the top ten, with Kimi Räikkönen behind him in 12th. Both Mercedes drivers got into the top ten shootout but neither of them set a time - making it a team strategy to try and save tyres. Lewis Hamilton set an early benchmark that no-one could beat, but Pastor Maldonado was the closest - second place and about five tenths off. Sebastian Vettel lined up in third place, whilst his teammate Mark Webber was down in seventh. Championship leader Fernando Alonso qualified fifth.